In the first installment of Marie Lu's dystopian series, we are introduced to a plague infected post-apocalyptic world. While the rich are protected from the plague by vaccines, the poor are most effected and are dying quickly. The United States no longer exists and the new governments, the Republic and the Colonies, are constantly at war. June, who has been brought up in the wealthy sectors of the Republic, is known as a prodigy because she scored a perfect 1500 on her military trials. Day, who was raised in the slums, is the Republic's most wanted criminal. When June's brother is murdered during a hospital break in, Day becomes the most likely suspect. June immediately goes on a Republic sponsored hunt to find Day and she will stop at nothing until she has captured her brother's killer. Undercover in the slums, June meets Day and discovers that he is not the person she thought he was and begins to question everything she has been taught by her beloved Republic. Anyone out there looking for another Hunger Games like adventure? If so, Marie Lu's Legend will not disappoint. Since reading The Hunger Games, I have stumbled across many dystopians, some worth my time and others not so much. 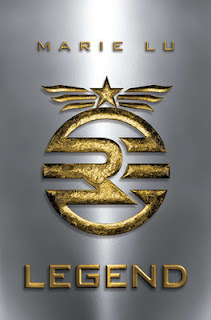 I was at first reluctant to pick up Legend because I am already in the middle of so many trilogies. I actually met Marie Lu last summer at the American Library Association conference and received Legend and an advance copy of the second book in the series, Prodigy. They have both been sitting on my shelf since then and I was finally convinced by a fellow literary friend to move them to the top of my book list. I quickly finished them both and am now anxiously awaiting the third book. The setting, characters, and plot are excellently crafted and make for another thrilling futuristic adventure. Note: The second book, Prodigy, was released today (January 29th, 2013)!